The flight from Manila to Melbourne was simple enough and I even slept, which is good as it was an overnight flight and then onwards to Auckland was heaven, Air New Zealand gave me an upgrade to one of their spaceseats, I slept the whole way, the most comfortable seat short of a business class bed. next morning, it may have been saying Oracle money, but at the expense of my sanity. I went downstairs and through gritted teeth, politely told them my woes, and asked if the person despatched half an hour ago had been found? The receptionist rang their IT to see if there was a problem their end, and informed me there wasn't but she would come and connect for me, she also bought along a power strip, which suggests they know there is an issue. She then managed to connect to the Internet immediately she tried and suggested I had done something wrong. I politely told her that I was an IT professional who stays in hotels 200+ nights a year and would she like to start the conversation again, based on the co-incidence that immediately after her call to IT everything worked. She then left me, 10 minutes later now that I could have the TV and PC plugged in at the same time, I tried the TV but that too was electronically challenged. To save the staff the opportunity to fob me off again, I returned to reception and suggested enough was enough. Again they offered to operate their equipment on my behalf and up she came to my room again, obviously I received this personal service as by now I was their favourite customer. After confirming I was actually right and not simply the normal idiotic class of customer stupid enough to stay in their hotel (name available on application), she accepted it was not working, and offered me another room. I suggested that now, 2 hours after my arrival that was not going to be enough and to her credit she did upgrade me. Once in the new room I decided the hotel would do, and apart from the questionable sanity of the cleaner assigned to my floor, there were no more problems until the obligatory 'discussion' around charges at checkout. Oh dear the rants of a seasoned traveller. Next day was Saturday and a dear friend who lives in NZ came unto to Auckland with her family including grand children and we had a great day at Auckland Zoo. I have to say it is a fantastic zoo, not the biggest in terms of numbers of animals but so much space for them, beautifully laid out. The family then went home but my friend stayed the night and we had a girly night out catching up. Early Sunday morning we caught a boat over to Rangitoto island, which we were in great danger of missing as the plenty of time we gave ourselves to get to the ferry terminal did not factor crossing the road as the Auckland Marathon arriving there. Rangitoto is a volcanic island and although only 25 minutes by ferry, very isolated and no permanent inhabitants. 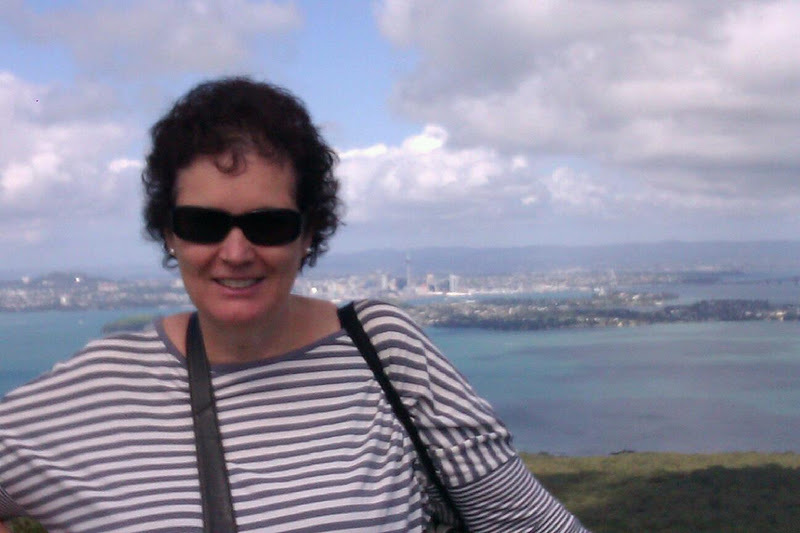 We walked around for a couple of hours exploring some of the more hidden areas and then did a tour being pulled by tractor around the main track and unto the base of the volcanic crater from where we climbed to the summit and walked around before returning back to Auckland. My friend left to go home after our lunch and I had a quick rest before meeting up with very one else arriving for the conference for a cocktail party. 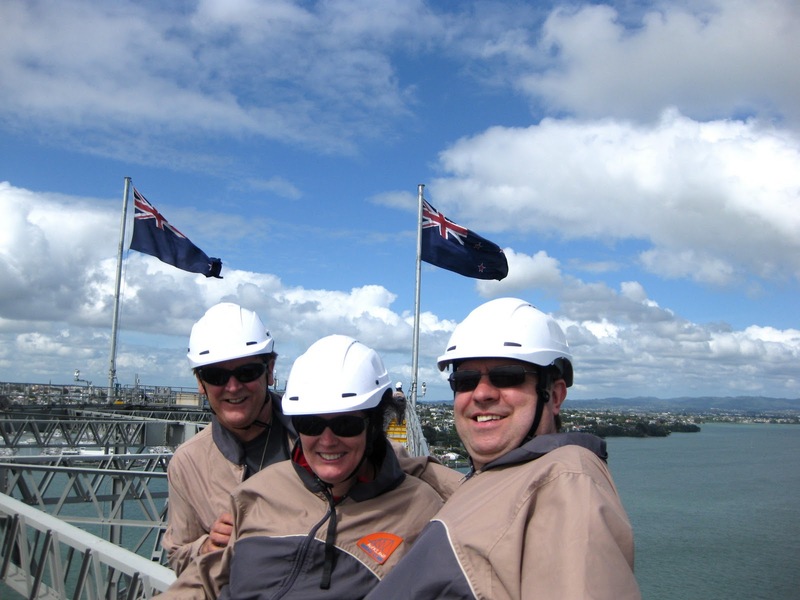 Although the conference was all day Monday and Tuesday I was not on until after lunch Monday so I took the opportunity to play truant in the morning and alongside Fred and Dave from Park Lane IT who I persuaded to join me, we did the Auckland Bridge Climb. I have to admit having a wobble on the transfer between the lower deck and the actual arch, but really enjoyed the experience and am proud of myself. It is linger than the Sydney Bridge but not as high. Perhaps I will do that on my next trip to Sydney. Back to the conference I attended a session from Lynne O'Donoghue who I know from when she was NZOUG President. She lives in Christchurch and gave a presentation 'Shaken but not deterred' about how the health board she works for coped with the series of earthquakes. It was a fantastic presentation, full of statistics and photos that put everything in context and how she and her team coped, kept running and assisted in the crisis and all whilst her own home had been destroyed. It was quite a humbling story. 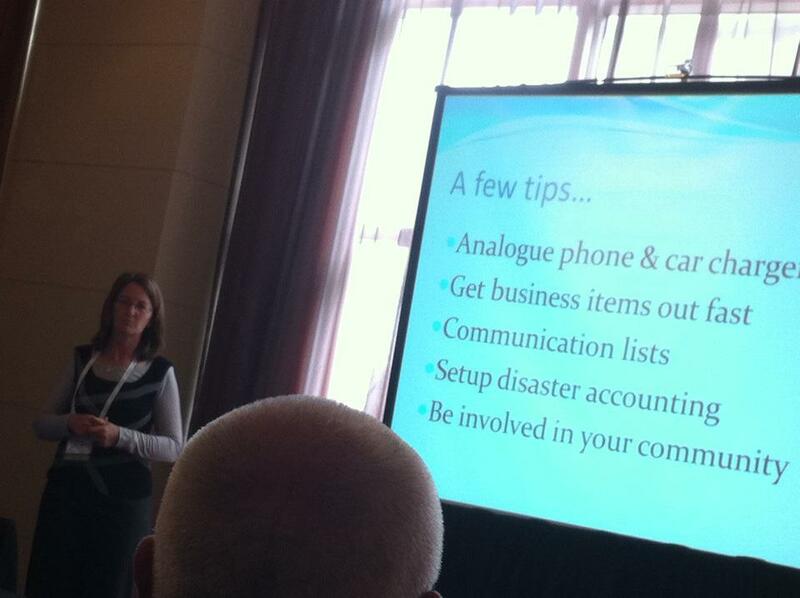 My presentation was immediately after hers and I felt 'how do I follow that?' Monday I presented 'Fusion Apps, what do they mean to you' and I got a great response. NZOUG hd two streams for apps plus a business stream and plus another 6 technical streams so people really wanted to be in the sessions, and I was really pleased with the feedback. At the end of the day it was time for an NZOUG tradition I and been warned about, their audience participation dinner. Where you sat was dictated by them and I was sat near the front of the stage, dangerous. The MC was a local actor, who albeit not the most famous was known and recognised by New Zealanders. The idea was ( and remember this was 31 October, Halloween ) it was 10 years since he had been an MC at a wedding at this very hotel and the bride had been murdered. He was then joined by another actor, the ghost of the bride. Then they selected 6 audience members to be the suspects for the murder and spent the evening whittling down the suspects based on their audience popularity. So first to be selected from the audience was .......ME. I was Chantelle the hard drinking, loose morals, over the top, maid of honour. Not sure why they thought I would be a good fit, but ever the polite guest I gave it my best. The other participants were TIm Hall as the groom, Bambi Price ( who is APOUC spokesperson for IOUC), Chris Muir as Father o'grady the priest, and two Local Oracle members as the wedding singer and the Chilean Chef. After being introduced and plateful to the audience we went back to our tables for dinner. I was loving this, but small issue, it was 8pm and I had a conference call with the UK at 9pm. So having had a word with the MC it was arranged that I would we voted off at the first cut. I tell you this because people kept coming unto me and saying I thought the clapping for you was really loud, why did you get voted off so quickly? Still I had to do the day job and I was back in time for the final part were the groom and the chef admitted it was all over their new found live for each other and in fact the chef was the murderer. 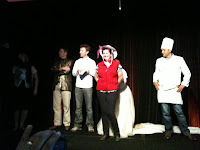 Well done NZOUG it was hysterical and a great crowd pleaser. It was also brilliant how they included the speakers in it, sometimes on these tours it is easy to just turn up, present and not really be an active part in the rest of the event. Tuesday started early, but the turnout was good and I had my 2nd presentation, the old favourite '42 Real Life Examples of FMW with Apps', again a great turnout and feedback. Then just before lunch I had my final presentation, a packed room for 'Should I Upgrade or go to Fusion Applications?'. 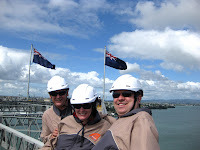 I loved NZOUG and the feedback I got was fantastic. I would go back anytime. The most beautiful things I saw in Auckland were the trees just outside the conference, these are Pōhutukawa commonly known as New Zealand Christmas Trees as they have a beautful red flower at that ti,e. These trees were over 300 years old and were proped up in places but just amazing. Then time to say goodbye, and off to the airport for my flight to Perth, grateful I am Star Alliance and therefore booked on Air New Zealand and not Qantas.